This is an incredibly easy soup to make. It’s made with diced potatoes and roasted Poblano peppers, and served with cubes of creamyPanela cheese. You can enjoy it with warm tortillas or crusty warm bread. 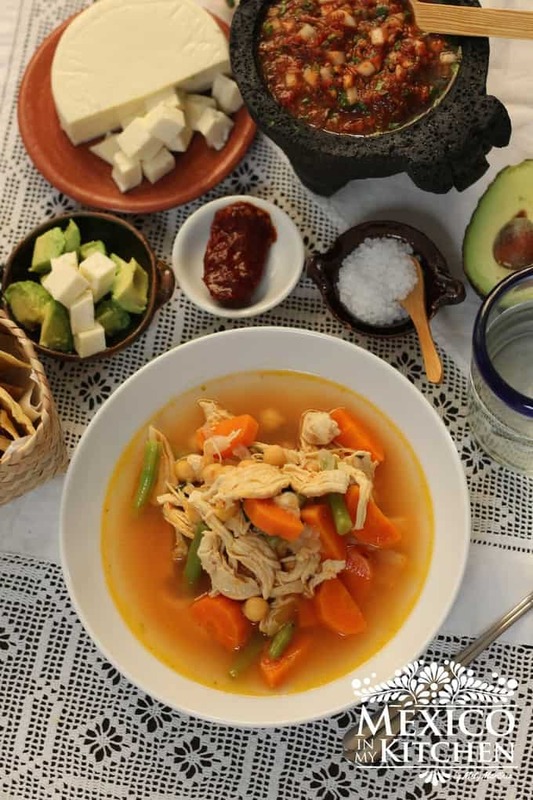 Like many countries, Mexico loves its soups, some of which are so popular that they have crossed borders, like the famous “Sopa deTortilla” (Tortilla Soup), the Red Pozole, and Menudo. In addition to those popular ones, we have a plethora of different soups found across Mexico, which use a variety of ingredients ranging from beans, vegetables, poultry, pork, fish, seafood, and even pasta and corn masa. Making a soup for dinner and pairing it with a salad is a great way to get out of the classic dinner routine of serving meat, a starch, and vegetables. At least one night a week, it’s good to try something different (and healthy!). For this Potato-Poblano Soup, I’m using Panela cheese, which is a very mild cheese similar to Queso Fresco, but less crumbly. If you can’t find it in your area, you can substitute it with any other cheese, just make sure to add it at serving time. There is another version of this Poblano Potato Soup that includes tomato along with the broth. If you want to add tomato to your soup, puree one medium size tomato with a ½ cup of the chicken broth (indicated in the ingredients list) and add it in step 4 before you add the chicken broth. Also, if you want to make it a vegan soup, simply substitute the chicken broth for vegetable broth (and omit the cheese). Sometimes, I also make this soup using Chayotes instead of potatoes. These are just a couple of examples for how you can mix up this soup by using different ingredients. Here is a quick photo tutorial on how to roast Poblano peppers if you have an electric stove. Turn your stove’s broiler on and place the peppers about 2 inches under the heat. This step is rather quick, and you need to be watching the process carefully to avoid burning the peppers. Once one side of the peppers’ skins starts forming blisters, turn them over (using kitchen tongs) to roast the other side. Remove promptly, then wrap them with a kitchen towel and let them rest for 5 minutes. The steam generated will make the skins easier to peel. Peel the skins off, then cut the peppers into strips, making sure to discard the seeds. 1. Place the potatoes in a saucepan with 4 cups of cold water. Turn the heat to medium-high and bring to a boil. Once it has come to a boil, reduce the heat and simmer for 8 minutes. The potatoes have to be cooked, but still firm. 2. Remove the potatoes from the heat and drain, then set aside. 3. Heat the oil in the saucepan, then add the chopped onion and garlic. Sauté for two minutes over medium heat until the onion becomes transparent. 4. Stir in the pre-cooked potatoes and Roasted Poblano pepper strips. Cook for two more minutes and then pour in the chicken broth. Add the cilantro sprigs and let everything simmer for 8 minutes. Make sure your potatoes are still firm, but cooked. Season with salt and pepper to taste. Just before serving, add the diced Panela cheese. Enjoy! This is an incredibly easy soup to make. It’s made with diced potatoes and roasted Poblano peppers, and served with cubes of creamy Panela cheese. 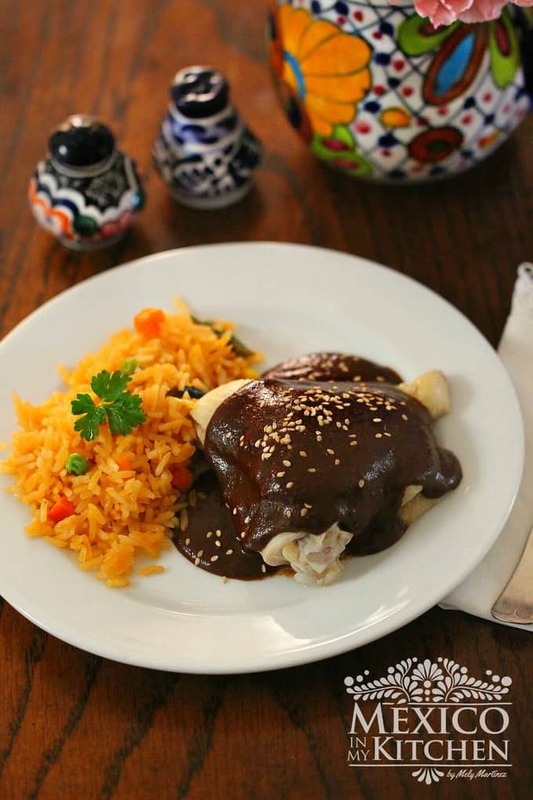 You can enjoy it with warm tortillas or crusty warm bread. Place the potatoes in a saucepan with 4 cups of cold water. Turn the heat to medium high and bring to a boil. Once it has come to a boil, reduce the heat and simmer for 8 minutes. The potatoes have to be cooked, but still firm. Remove the potatoes from the heat and drain, then set aside. Heat the oil in the saucepan, then add the chopped onion and garlic. Sauté for two minutes over medium heat until the onion becomes transparent. Stir in the precooked potatoes and Roasted Poblano pepper strips. Cook for two more minutes and then pour in the chicken broth. Add the cilantro sprigs and let everything simmer for 8 minutes. Make sure your potatoes are still firm, but cooked. Season with salt and pepper to taste. Once one side of the peppers’ skins start forming blisters, turn them over (using kitchen tongs) to roast the other side. Remove promptly, then wrap them with a kitchen towel and let them rest for 5 minutes. The steam generated will make the skins easier to peel. Peel the skins off, then cut the peppers into strips, making sure to discard the seeds. I made this soup the other night, it was so good. My 8 year old requested this soup for dinner again today. Thank you for sharing these recipes, they always come out great! Looking for easy way to make corn tamales,with out all the grinding😱the old way…..HELP! What type of tamales do you want to make? If you want to make tamales without all the grinding, make tamales using corn masa, or masa-harina. Depending on where do you live, you can find it at Latin stores. If you want to make corn tamales the ones that use fresh corn tamales, you can use your blender or food processor. What type of tamales do you want to make?